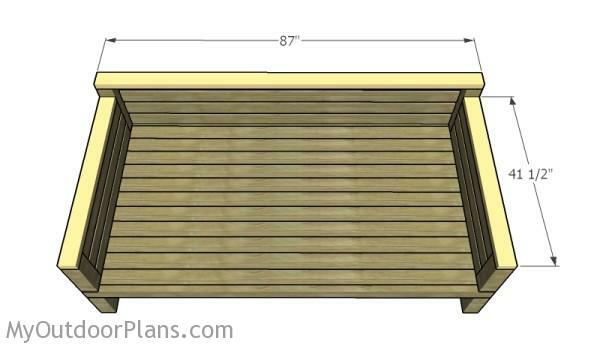 This step by step diy woodworking project is about outdoor daybed plans. 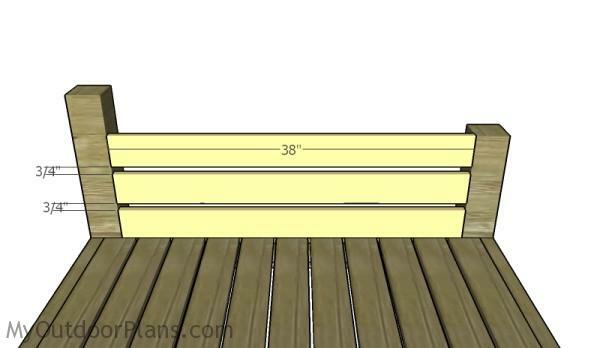 The project features instructions for building a basic daybed that can be used both indoor and outdoor. 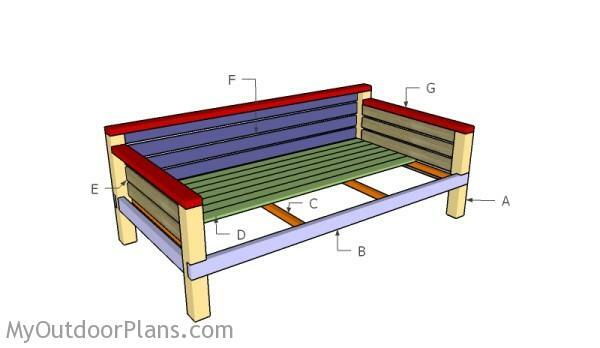 If you have basic woodworking skills and common household tools, you can build this daybed in one weekend. Use a 39×80 mattress for this daybed. Make sure you take a look over the rest of plans to see alternatives and more projects for your garden. 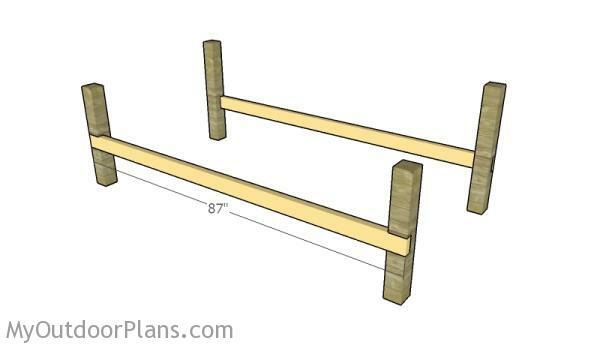 The first step of the project is to build the legs for the daybed. As you can easily notice in the diagram, we recommend you to use 4×4 lumber for the components. Mark the cut lines and make parallel cuts inside the area (1 1/2″ deep). Use a chisel to remove the excess material and smooth the recess area with sandpaper. Next, you need to attach the 2×4 supports to the front and to the back legs. Fit the supports to the notches, as shown in the diagram. Drill pilot holes through the supports and secure them to the legs using 2 1/2″ screws. Add glue to the joints and make sure the corners are square. Continue the project by locking the front and the back of the daybed together. Drill pocket holes at both ends of the supports and lock them to the 4×4 legs using 2 1/2″ screws. Make sure the corners are square and the edges are flush, for a professional result. Build the cleats from 2×2 lumber. Drill pocket holes at both ends of the cleats, fit them to the frame of the daybed and insert 2 1/2″ screws to lock them into place tightly. Make sure the corners are square and leave 3/4″ from the top edge of the frame to the cleats. 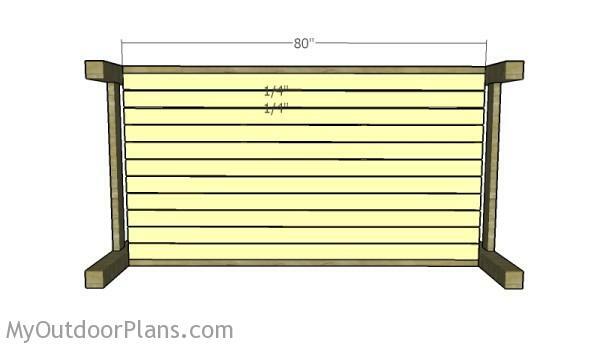 Fit the 1×4 slats to the daybed, as shown in the plans. Drill pilot holes and insert 1 1/4″ screws to secure the slat to the cleats. Place the slats equally-spaced for a professional result. 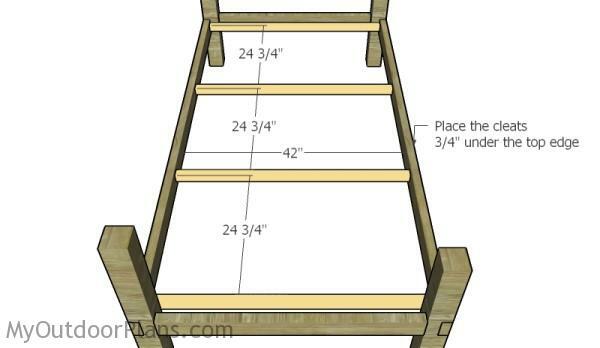 Next, you have to build the sides of the daybed. 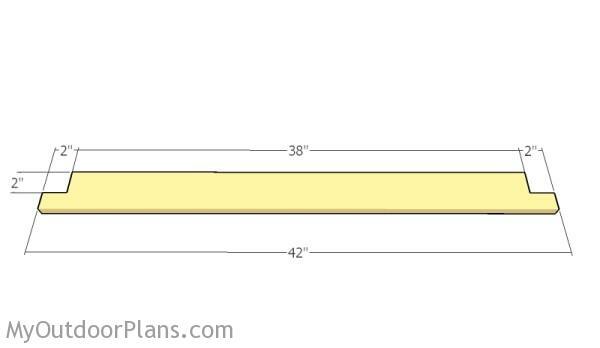 Therefore, cut the 1×4 slats at 38″ and drill pocket holes at both ends. Fit the slats to the side legs, as shown in the diagram. 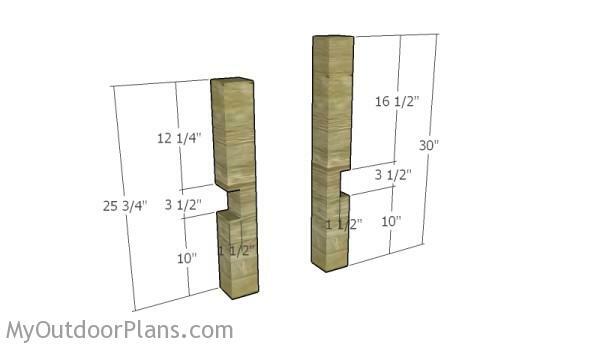 Insert 1 1/4″ screws to lock the slats to the posts, as shown in the diagram. 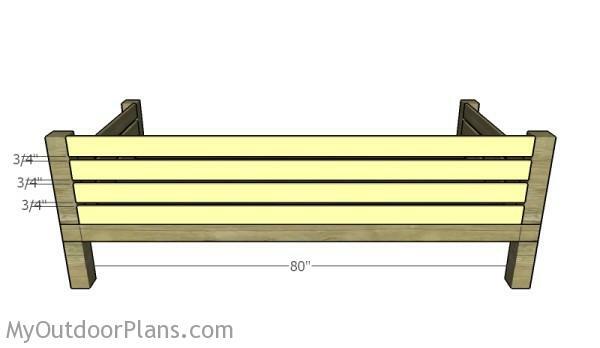 Fit the 1×4 slats to the back of the daybed. Drill pocket holes at both ends of the slats and insert 1 1/4″ screws into the posts. Place the posts equally-spaced for a professional result. In order to enhance the look of the outdoor bed, you have to attach 2×4 trims to the sides and to the backrest. Smooth the cut edges before fitting the trims into place. Make sure the edges are flush, drill pilot holes and insert 2 1/2″ screws. If you want to create storage areas on both sides of the daybed, we recommend you to fit 1×4 slats under the structure. Make notches at both ends of the slats with a circular saw and smooth the edges with sandpaper. 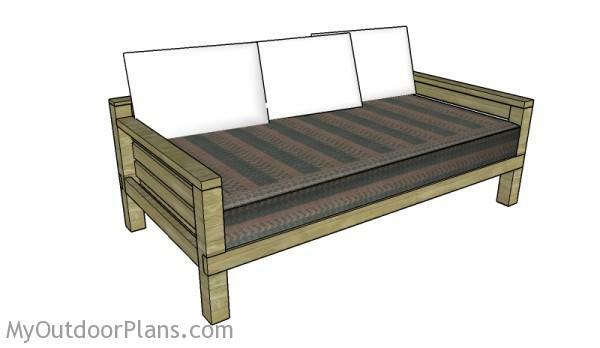 Fit the slats to the daybed, as shown in the plans. 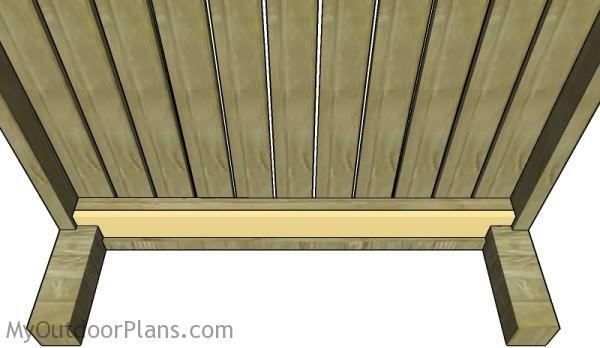 Use 1 1/4″ screws to lock the slats into place tightly. Last but not least, you should take care of the finishing touches, as to be able to continue the process with the rest of the steps. Fill the holes with wood putty and smooth the surface with fine-grit sandpaper. Top Tip: Check out the rest of the woodworking projects for more inspiration for your backyard. 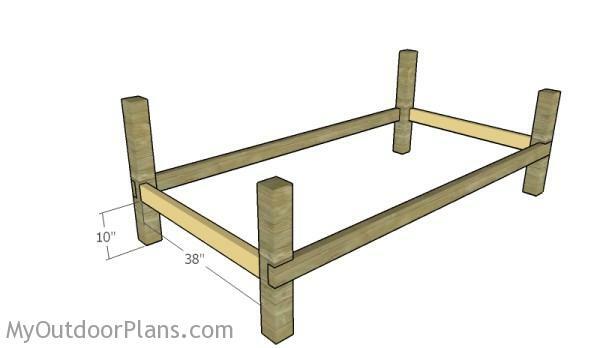 This woodworking project was about diy daybed plans. If you want to see more outdoor plans, check out the rest of our step by step projects and follow the instructions to obtain a professional result.